At Hannover Messe Sick will be launching the UE410 Flexisoft, a DIN-rail-mounted, software-based modular safety controller for applications that require more sophistication than basic safety relays can offer but not the complexity available from a full-scale safety PLC. The UE410 Flexisoft is a development of the well established UE410 Flexi Classic. 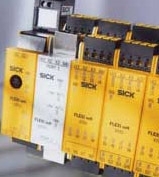 Where the UE410 Flexi Classic was programmed by means of rotary switches, the Flexisoft comes with a software configuration tool that enables competent engineers to configure complex safety systems - from simple logic gates like AND, OR, etc, to more advanced functions such as safe on/off timers and set/reset function blocks. Iain Smith, Product Specialist for Integration Technology at Sick UK, says: "The UE410 Flexi Classic is designed for customers who want to manipulate safety logic without going through PC software, and this is still the best solution for customers not wanting to adopt a software safety solution. The UE410 Flexisoft units are 22.5mm wide and programming is achieved through a small M8 connector port on the CPU from a serial cable connected to a PC's RS232 connector port. The program is in the plug; if the system needs replacing for any reason, you just take the 'system plug' out, put a new unit in and put the plug back in. You do not have to worry about reprogramming or forming links between terminals." The UE410 Flexisoft series comprises a number of units: a CPU control unit; an eight single-channel safety input module; a mixed eight input, four output module; a one dual-channel safety relay output module (2N/O); and a two dual-channel safety relay output module (4N/O). Diagnostic data can be obtained from the RS232 port on the main CPU and later in 2008 diagnostic modules will be launched with bidirectional interfacing to standard network topologies. Types of sensor that can be connected include electromechanical and non-contact safety switches, light curtains and light switches, laser scanners and camera systems, two-hand controls, safety mats and safety edges. Actuators include motor contactors, drives and signalling equipment. These modules can then be combined with one another to build a bespoke safety logic system specific to the user's application, using the interface connections on the side of each unit. A combination of up to 96 inputs and 48 outputs can be supported. UE410 Flexisoft has two CPU variants - one with the enhanced field interface (EFI) and one without. The former has two EFI ports, allowing the connection of scanners and light curtains. Using the Flexisoft software tool, the engineer can configure a safety system by selecting safety function blocks from a schematic front end and connecting them together in a logic editor.